“Compared to freelancers, job hunters have it easy. All they have to do is find one employer to hire them, then they’re done,” declares Martha Retallick, author of the e-book “Freelancer’s Guide to Finding Clients“. “Contrast that with the freelancer, whose success in making a living depends on the ability to land not just one job, but many of them, in a single year.” The Tucson, Arizona native’s own experience as a freelance graphic designer, photographer, and writer – and, by the way, freelancers are also entrepreneurs in their own right – shares her own system and ways of sourcing for clients, including cold-calling (and warm-calling, too), market research, finding leads and handling e-mails. She also provides useful resources such as phone scripts, e-mail templates, and a progress-tracking spreadsheet that other freelancers – and small business owners – can use to solicit business. While many other commentators tell you to go after “low-hanging fruit”, Retallick is a proponent of cold-calling, and says that her best and most profitable clients are those that she has gotten through cold calls. “At a time when social media and texting are all the rage, working the phone is still a valuable skill,” says Retallick. What’s insanely useful are tips on how to deal with various levels of rejections – the dreaded ‘No’ may not exactly be a no – as well as some very simple, good habits to keep the business pipeline running. 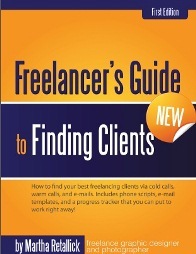 Like all good self-help e-books, “Freelancer’s Guide to Finding Clients” is short, succinct and easy to finish in an hour or so, but is somewhat pricey at US$24.95 (price revised to US$15 on Oct 6, 2011). The e-book is available for purchase here (link updated Oct 6, 2011). If you’re not quite sure yet, do check out a free sample.